This morning (Thursday), we packed up camp in Acadia and prepared to move on to Cobscook SP in Vermont. 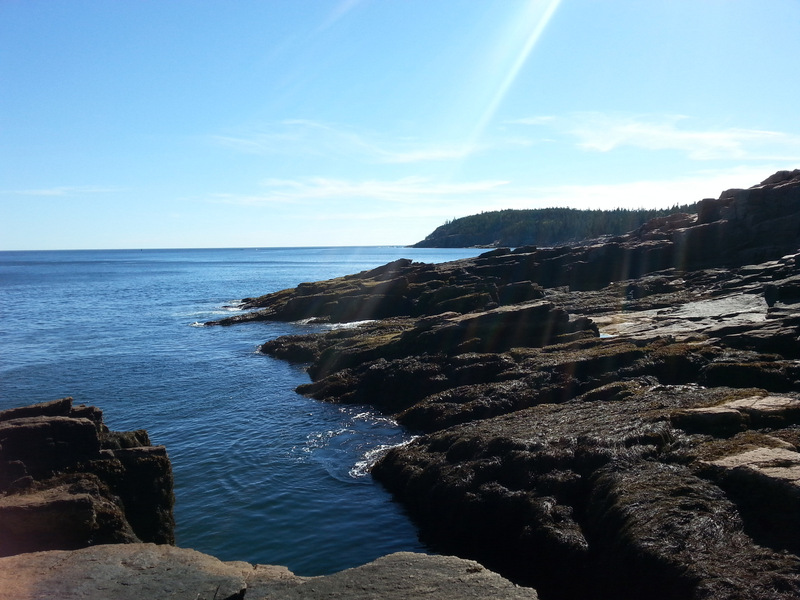 Heading out of town, we were saddened by all the facets of Acadia that we didn’t get to see. 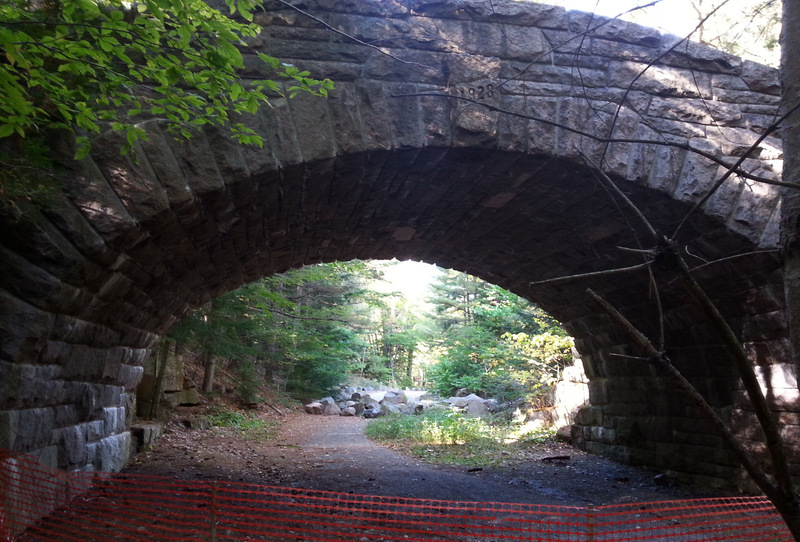 Hiking, cycling the Carriage Trails, finding Bubble Pond (whatever THAT is), and so many other things. Reflecting on our hike to Mt. 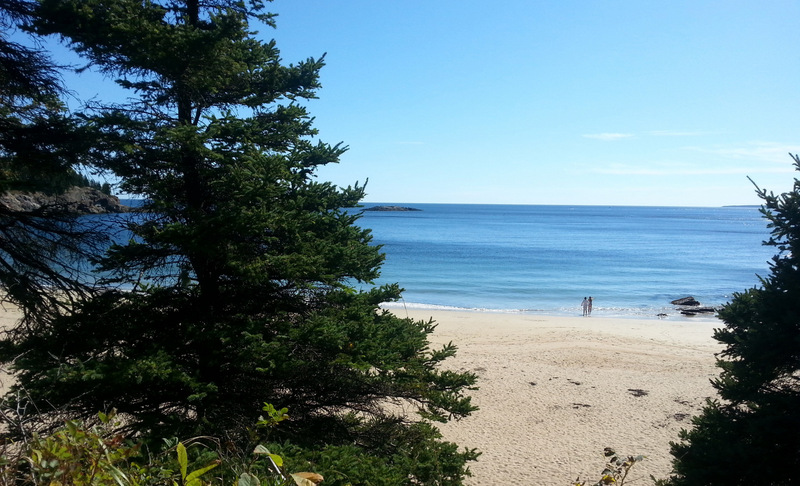 Cadillac, we figured that we had the ideal day in Acadia – no traffic, no crowds. 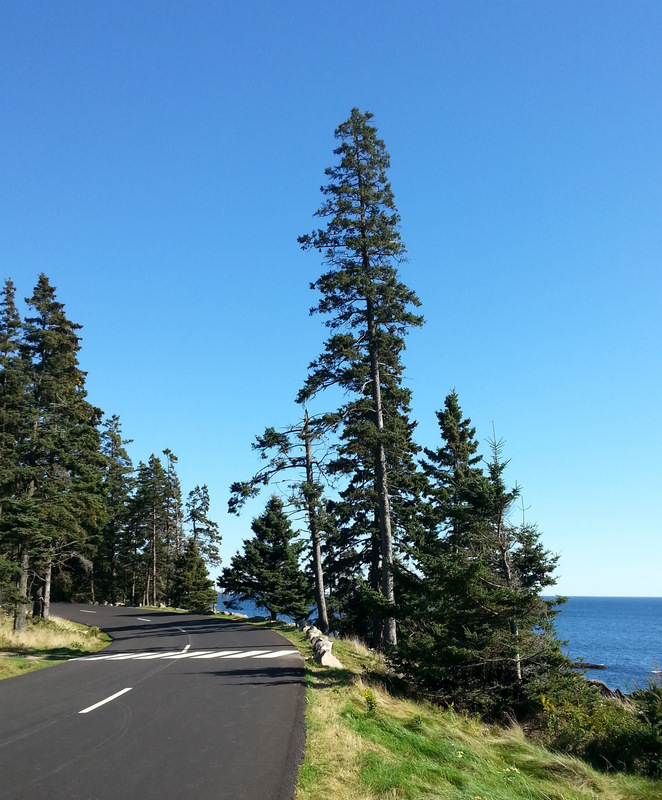 deserted roads – this is the only access road thru Acadia. Why wouldn’t we decide to hang around for more of the same? So, trading our fear of crowds in campgrounds for our love of having an entire National Park to share with only a very few people, we decided to stay around the Acadia area for three more nights. It’s too beautiful to pass up the chance to have such a solitary visit. So, we find ourselves at Bar Harbor Campground, an RV/campground. We usually don’t like this kind of spot – small, close-together campsites with little privacy, and little outdoor activity. Not our style. But, we did score an ocean-view site, and we have electric and water for the first time in two weeks. Such a luxury. Wifi – oh my! John’s baking potatoes in the Dutch oven on our ocean view campsite. Something we haven’t had on this trip, yet. We capitulated. Funny thing though….we’re paying $38/night for our site, compared to $10 at Acadia. But, the showers here are still coin-op! $.25 for 5 minutes. Admittedly, this is a pittance, but does anyone other than me see this as a bit cheesy? 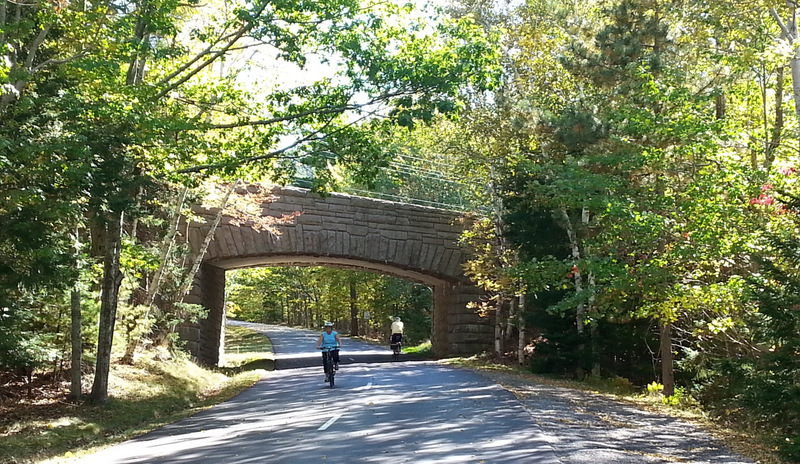 So, all wired in to our new campsite, we decided to ride our bikes back into Acadia, and enjoy the 30 mile Loop Road, an up & down, newly paved road, which encircles the entire Park, taking in most of its major attractions. We shared the path with perhaps 100 other cyclists (going both ways on a one-way road), and perhaps another 100 hikers. Everyone ignored the barriers. Cars had to park outside, as the fences were not passable, but bikes and hikers could jump around or over. Big smiles all around. The new surface more than made up for all the hille. What a terrific ride! No cars. Few bikes. Fewer hikers. The lawbreakers were old & young, domestic & foreign, and with kids or kidless. Sand Point Beach was deserted. It was amazing. We circled the Park, stopping at every turnout and scenic viewpoint, chatting with others and congratulating ourselves on our good luck. Can you imagine having an entire National Park to yourself? Thunder Hole – during high tide, the waves splash up over the top. So, criticize us if you will for entering when we legally shouldn’t have.. We left no trace and caused no damage. Tomorrow, our plans are to explore the surrounding area outside the Park using the free shuttle bus that roams the area. Saturday, we’ll head back into Acada to ride the Carriage Paths and hike a few of the really short, steep cliffs. We’re happy with our decision to stay. 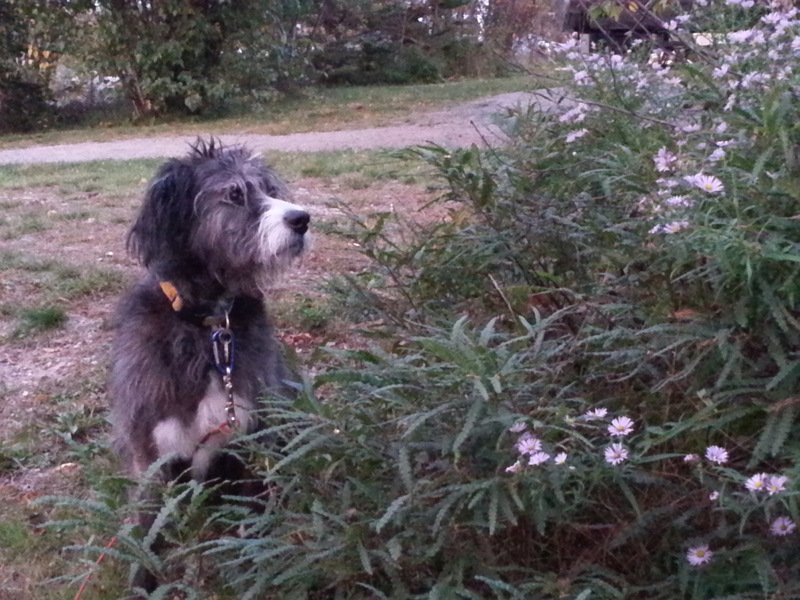 Jezzy happy in BH Campground, as well. On Sunday, we’ll probably wander north to Cobscook State Park, up on the Canadian border. 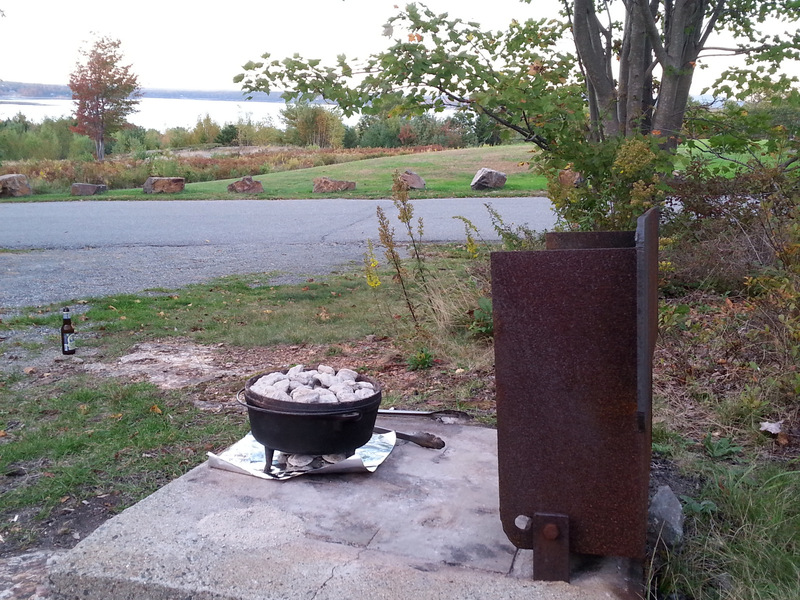 There are places here that will deliver cooked lobster dinner to your campsites here. Lobster fest will recommence, tomorrow. This entry was posted in camping, cycling, great outdoors, Maine, national parks, retirement, simple camping and tagged camping, cycling, historic sites, Maine, national parks, retirement, road trip, RV life, simple camping, the great outdoors by Judy Crankshaw. Bookmark the permalink. Every place you post photos of is more beautiful than the last. Having the park almost to yourself? Heaven! And congratulations on breaking those petty, vindictive rules. That is PUBLIC land! Yeah! Score one for the little guy! I’ve never known any criminals in my life. This IS exciting!!! The only reason that the parks are barricaded is vindictiveness on the part of government officials.Loved the photos and scenery, I hope that you enjoy your stay there. Agree. We’ve come to the realization that we may be here at the best time, instead of the worst time. I feel sorry for all the folks here who don’t have the ability to bike or hike their way around, and were hoping to drive or bus thru the Park.